Ten students interested in law had a fantastic opportunity to visit the Royal Courts of Justice on Friday 8th March. The event was part of a programme to get ‘law into schools and schools in the law’, and to dispel some of the myths about the law, for example that it is only for white, public-school educated men. During the tour of the Courts we saw some of the quirks of the building, and some of the court rooms where famous cases have been heard. Court 10, in 1884 heard the case of R v Dudley and Stephens, where a boy had been killed and eaten by some desperate survivors of a shipwreck. The Judge ruled that ‘necessity’ could no longer be a defence in a murder trial. We also heard about more recent cases between Apple and Samsung, and Top Shop and Rhianna, where Rhianna won £2 -3 million in compensation. 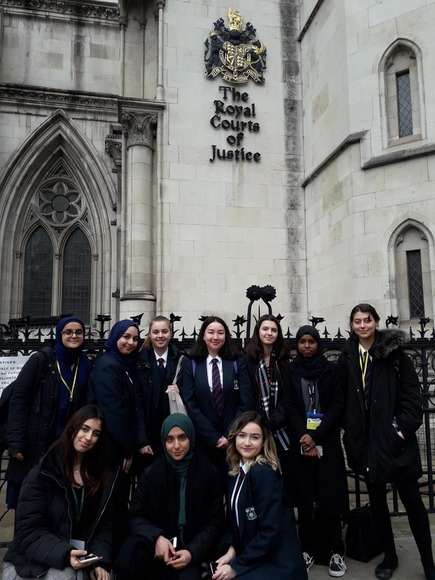 Along with other schools, the group then went into Court 4 where there was a panel of 5 Judges, including the Right Honourable Lady Justice Hallett, three other female judges, and Judge Ikram. Students from the floor asked questions and Copthall’s Evelyn Taylor 11L, asked how far does the media influence court cases. The students found out what it was like to be a Judge, what qualities are needed and it was interesting that none of the panel of judges had ever dreamt that they would end up being a judge. The visit offered a fascinating insight into the legal system and the role of judges, and the overall message was that anyone can have a career in the law, and even become a judge, if they work hard and take advantage of opportunities offered to them.